Totes Amazeballs – or how my adventures in dual-booting my steambox with win10TP are failing. So I’m sitting here in a room with a bunch of friends and good people, settling in for a good weekend. Yet, I’m attempting to escalate my steambox to a full dual-boot. What I did did previously was install SteamOS, then unplugged that drive and installed Win8.1 on the other. This weekend I’m making the fresh attempt to get everything running. Firstly installing 10 on Drive0, and then SteamOS on Drive1. Both are in place, however grub didn’t do anything with the boot manager. This is what I’m choosing to do when not playing games, or waiting for other friends to turn up. In the new year I’m intending to finally acquire a new SSD, from there I can do a fresh main system install, at which point I’ll probably be swapping motherboards between systems. This is primarily as the g1Sniper, whilst nice, has sucky linux driver support, and thus is primarily wasted. Alas I’ll most likely have to downgrade to a 5.1 setup, but what can you do. The answer to my problems is obviously to praise GabeN, for I am 550 yards from the hole. Teamwork – In Space Things Will Explode. So tonight a group of friends got together for a project called Horrible Stream to play a game called Artemis. This is a star-ship bridge simulator game, we had 10+ people in one room attempting to work together. Originally we considered running two ships, but the problem was both competing crews were in the same room, so we abandoned that idea. Under the command of Captain Wolfmother, the S.S. Sandox (LoveULongTime, ‘sWarhead, ‘sThing, ‘sShongalong etc,) attempted to plumb the depths of space and generally not explode. We did have a successful mission, we also had a failed mission where Weapons told me the Helm to fly in to one of our own mines. Things changed up a lot, I stuck with Helm the entire time, and we had some incidents with Comms Officer Wolfmother (after things changed) effectively declaring war, and Weapons launching a trio of nuclear warheads at a cluster of 7 newly aggravated warships. Artemis, gonna be good in future as everyone enjoyed themselves. So in just under 8 hours, the doors to Respawn LAN‘s 32nd main event open. There’s still a chance to register for fun and games. For example, there is a candy filled pinata, there are jars of candy I assume for prizes and everything. We’ve managed to update the media tech side of things this event, and the event stream will be more awesome than ever, with the ability for tweets to the tag #RespawnV32 to turn up at our behest. 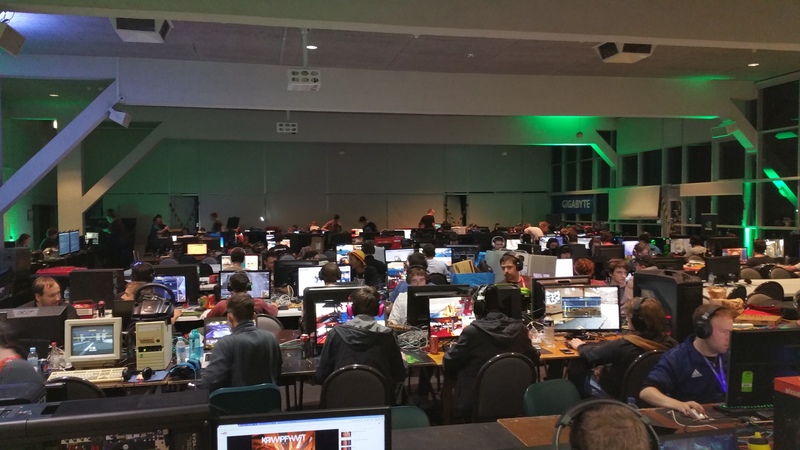 425 odd players in one place, we’re on the way towards a petabyte of data in one place and a massive steamcache.